Once you click submit, we will send you an email asking you to confirm your registration. We will then provide you with the download link for The Healing Power of Sunlight and Vitamin D. By submitting this form, you understand that you will also be subscribed to the NaturalNews email newsletter. Your privacy is assured and your information is kept confidential. You may unsubscribe at anytime. 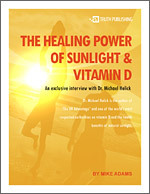 Dr. Michael Holick is the world's foremost authority on vitamin D and the healing power of natural sunlight. He's the author of The UV Advantage, and in this interview, Dr. Holick reveals fascinating facts on how vitamin D is created and used in the human body to ward off chronic diseases like cancer, osteoporosis, mental disorders and more. This is one of the most eye-opening interviews you'll ever read on health. Why and how your body manufactures vitamin D.
How your body automatically regulates proper levels of vitamin D, even with excessive sunlight exposure. Why vitamin D deficiencies are now epidemic in the American population (and what it means to their health). How vitamin D deficiencies cause prostate cancer, breast cancer, cervical cancer, osteoporosis, rickets and other diseases. Why African Americans and Hispanics are especially susceptible to vitamin D deficiencies due to skin pigmentation. Why the sunscreen industry doesn't want you to read this information and has tried to discredit Dr. Holick. Why milk and orange juice are poor sources for vitamin D. Revealed: a much better nutritional supplement that provides a vitamin D boost! Why where you live on the planet ultimately determines how much sunlight you need. How dermatologists misinform people about the real risks of sun exposure. Seasonal Affective Disorder: how to treat it with sunlight exposure. Revealed: a simple, five-second test that reveals whether you're suffering from severe vitamin D deficiency. Why vitamin D defiencies impair your body's ability to absorb calcium! Fifteen facts you probably never knew about vitamin D.
A complete list of diseases and disorders caused by vitamin D deficiencies. Biology of Belief by Bruce H. Lipton, PH.D. Spiritual Nutrition by Gabriel Cousens, M.D. FREE Cartoons, Podcasts, & Streaming Video! I guarantee you'll love the information you receive as a NaturalNews subscriber. If you don't like it for any reason, you can unsubscribe at any time by simply clicking an unsubscribe link found at the bottom of each email we send you. Your privacy is 100% protected. We don't send spam, and we don't sell emails to anyone. Subscribe with confidence. Join over 500,000 readers from around the world who turn to NaturalNews each month for the most respected, independent news and information in the industry. "Mike Adams is one of America's great journalists and freedom fighters. His ability to deliver important leading edge nutrition and healing information is unparalleled in all of journalism. Over the years, not only have I learned to respect and consider Mike Adam's opinion in all areas of nutrition, I have also found the scientific facts he references about his subject matter to be consistently accurate. Every time I get to read his words or see him speak, he makes my day The Best Day Ever! He can do the same for you!" "Mike Adams has one of the best websites on the Internet. His articles, podcasts and books will improve your life, and possibly save it. I admire him for his fearlessness in awakening people to the truth about everything they put into their body, or around it. As a journalist he is relentless in his questioning, always asking insightful questions to expose the truth." Jay Robb Proteins, and CEO of Jay Robb Enterprises Inc. This site is part of the NaturalNews Network © 2008 All Rights Reserved. Privacy | Terms All content posted on this site is commentary or opinion and is protected under Free Speech. Truth Publishing International, LTD. has full ownership of and takes sole responsibility for all content. Truth Publishing sells no health or nutritional products and earns no money from health product manufacturers or promoters. The information on this site is provided for educational and entertainment purposes only. It is not intended as a substitute for professional advice of any kind. Truth Publishing assumes no responsibility for the use or misuse of this material. Your use of this website indicates your agreement to these terms and those published here. All trademarks, registered trademarks and servicemarks mentioned on this site are the property of their respective owners.